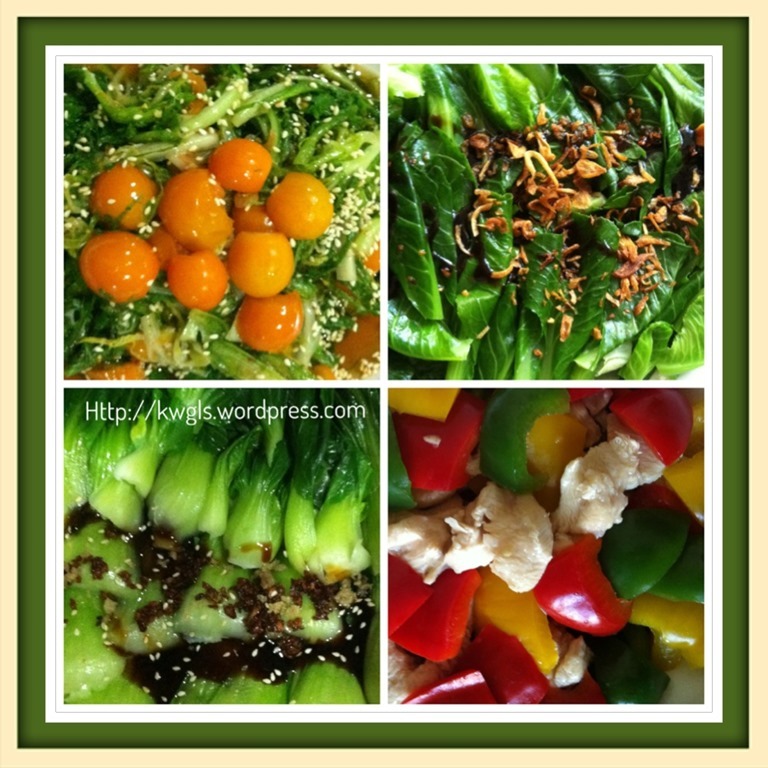 Traditional Chinese cooking don’t usually use the blanching method for cooking its vegetables. Usually, they stir fried with oil in a hot wok or frying pan. My mum will usually take out a frying pan, put in some oil, stir fry the garlic or shallots until golden brown, throw in the vegetables, add seasonings, stir fried for another 1-2 minutes and scope in the plate for serving. That is rather traditional and applicable to almost all types of vegetables. The disadvantages of using oil for stir flying vegetables are that the vegetable’s will lose its color and some vitamins will lose in this process. In most restaurants, realizing that the color of the vegetables will turn less appealing and that the texture will be compromised, the chef will usually blanched the vegetable before stir frying the vegetables. 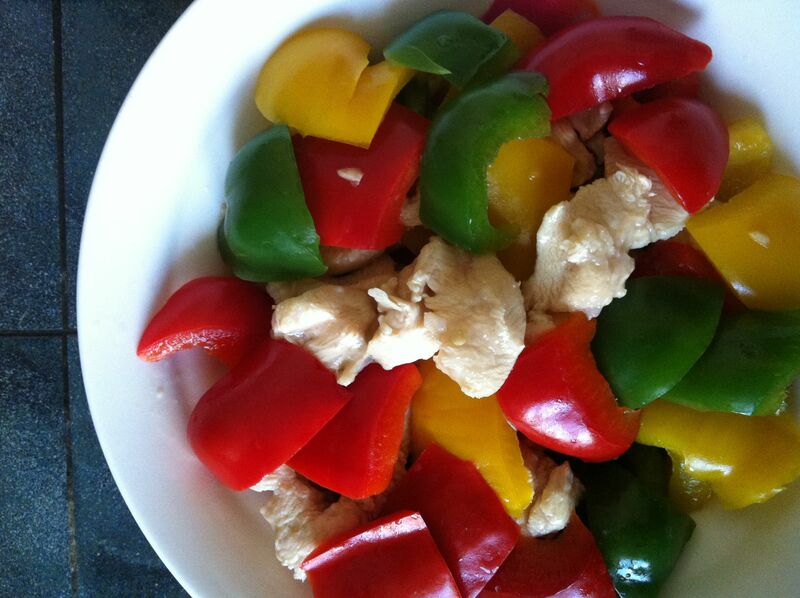 This will cut short the stir frying time so as to preserve its greenish appearance and some of the vitamins. 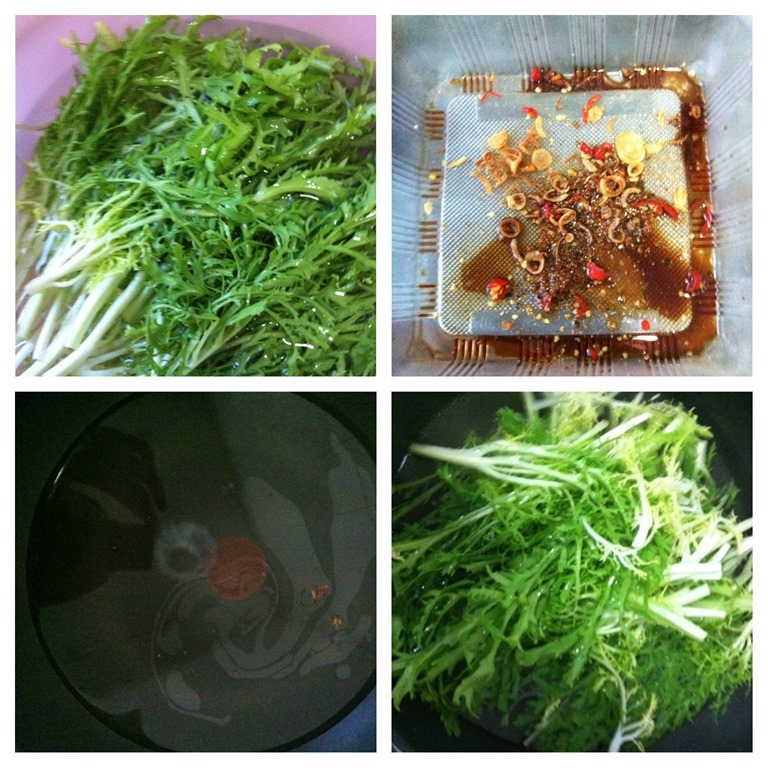 In this post, I will share with you the various combinations that you can prepare your vegetable dish using the water blanching method without stir frying but the dishes are equally tasty. My son, aged 7 have a slightly high body mass index and was requested by the school authority to participate in the weight reduction program. Knowing that the school is concerning about his weight issue, I have decided to alter my methods of cooking and one of which is by blanching the vegetables instead of stir frying the vegetables. 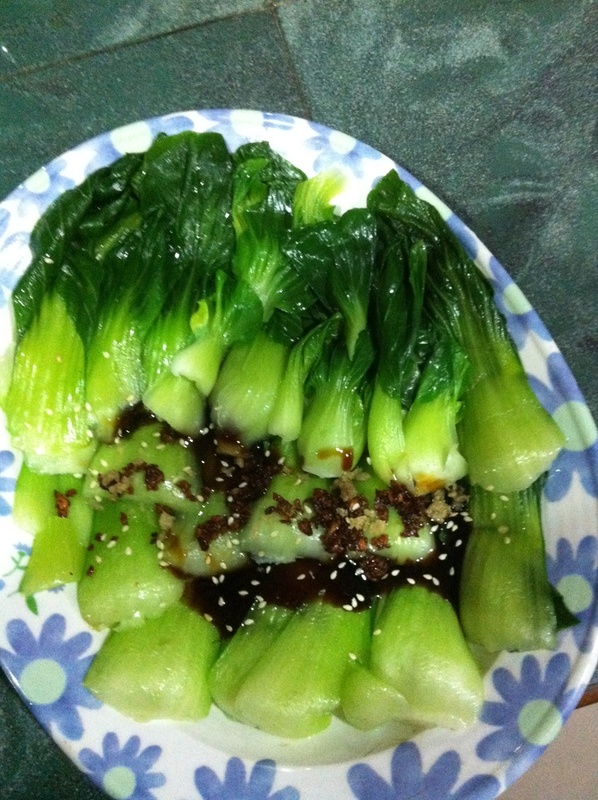 The first meal (blanched kailan with oyster sauce) was well received by my family members and the whole plate of vegetables were being snatched by my son, daughter and wife within 5 minutes of putting in the table. Seeing such a good response from the family members, I have decided to explore more vegetables and with as many types of dressing as possible..In the next 9 meals that I prepared, I have created different dressings with different vegetables and to my delight, they don’t really notice the difference and my son have requested for more vegetables.. 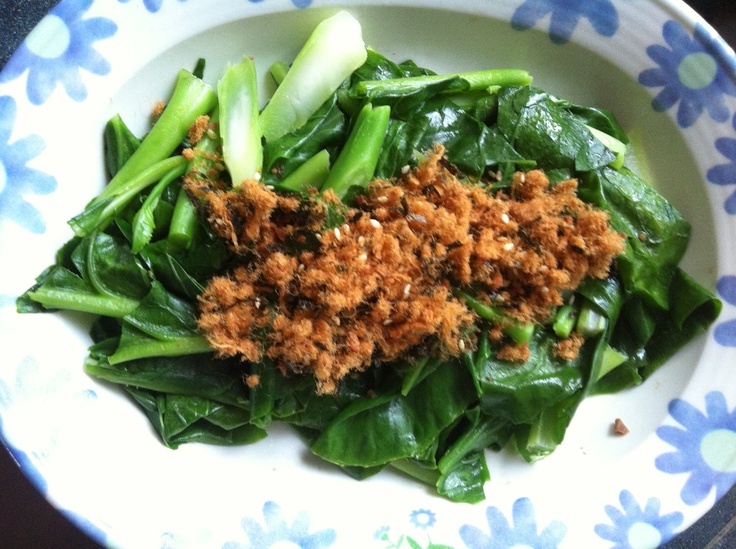 In this post, I will share with readers one vegetable dish that I have prepared for my dinner today – Chrysanthemum green with Chinese black vinegar dressing (春菊拌浙醋）。Measurements were intentionally omitted as it is just vegetables plus seasonings all of which can be adjusted to individual tastes. Chrysanthemum green is a type of vegetables that are quite common in Korean, Japanese , Taiwanese and Cantonese Cuisines. It can be eaten raw but the stems can be slightly tough. It can be stir fried, blanched or cooked in soup or appeared as a garnish in some Chinese dishes like Taiwanese oyster pancake. Wash the vegetables and set aside. As this preparation only deal with blanching, you may wish to soak the vegetables in the water for a longer while to clear all unseen particles and chemicals..
Take out a container or salad bowl and put in your condiments. In the above picture, I have included some shredded chili, fried onions, Chinese black vinegar, salt, pepper and sesame oil. In a frying pan, put in some water. Add in pinches of salt (as you can see the white patch next to the red color patch) and a few drops of onion oil (cooking oil also can be used). This feel drop of oils are very important to preserve the color of your blanched vegetables and to keep the juices in the vegetables. When the water is boiling, throw in the chrysanthemum green and let it boiled for about 3 minutes. Add in the cherry tomatoes and blanched for another 1-2 minutes. Sieve the blanched vegetables and transfer to the salad bowl or the mixing container. Note that I have by passed the step of blanching the vegetable in some ice water as the dish will be served immediately after it is prepared. However, if you prefer, you can dip the blanched vegetable in ice water of about 1 minutes to preserve its crunchiness (not necessary depending on type of vegetables) and color. Stir until well mix and transfer to another plate. Sprinkle with sesame seed and best served hot with rice. 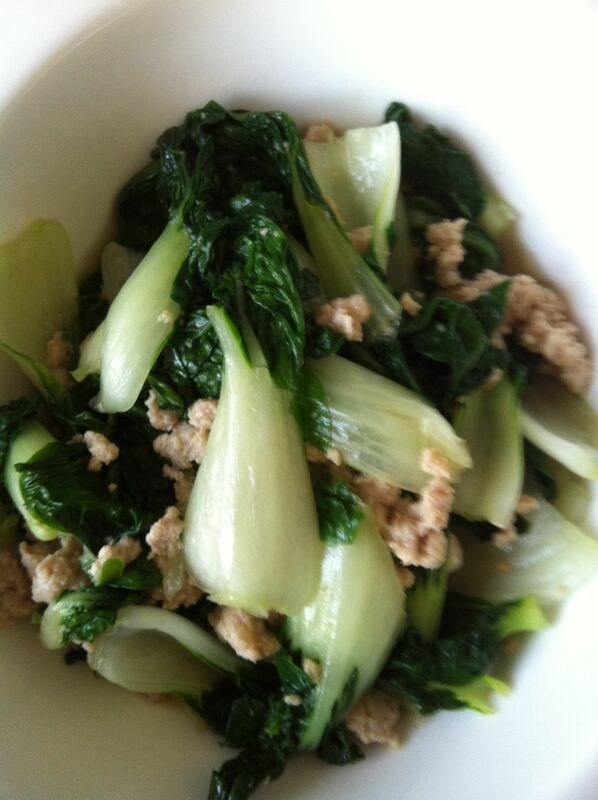 The dish is simple and as chrysanthemum greens are a bit tough, you can blanch it longer and cut into smaller pieces. 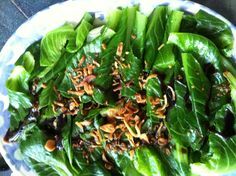 This dish is full of vitamins and the Chinese black vinegar dressing is just like the French dressing in French cuisines. Of course there are oriental elements such as sesame oil and black vinegar that make it taste like Chinese cuisines. Should I have lime (kalamansi with me), I will use it instead of black vinegar. It is fully flexible be it type of dressings, toppings and vegetables. For the sake of oil less cooking, there are many Chinese vegetable dishes which can use the blanching method instead of traditional stir frying method. 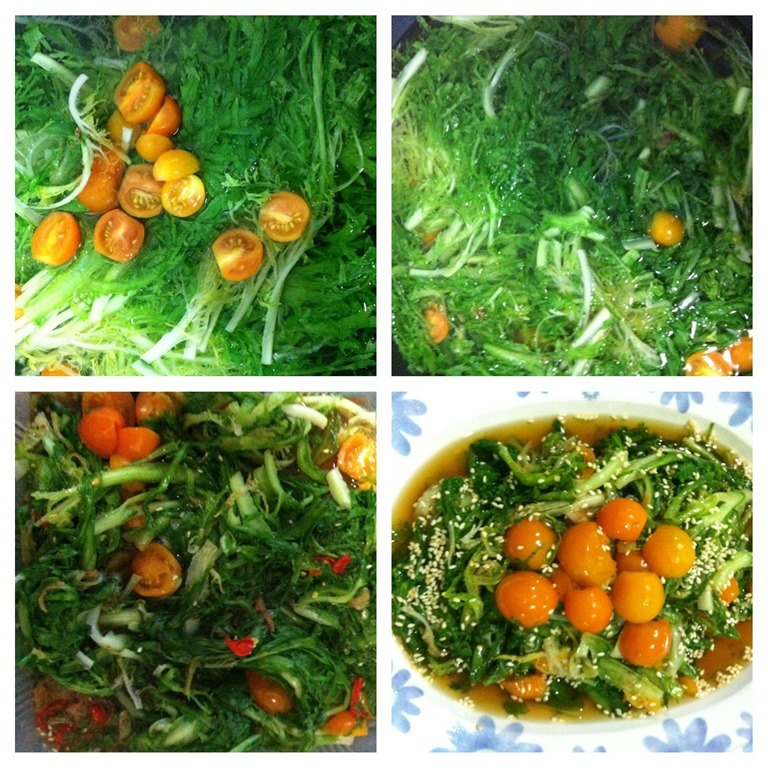 Blanching method of Chinese vegetable dishes like the Western cuisine’s salad preparation is a matter of finding the right combination of vegetables and dressings. Chinese are less prone to eating the vegetables freshly picked (raw), therefore in order to promote healthier eating habitat with minimal amount of fats possible, an intermediary step is to blanch the vegetables . The following table shows different types of Chinese vegetables that I have ever cooked using the blanching method and different dressings used. Both the list of vegetables and dressings are endless and are open to all types of combinations depending on the chef’s creativities. 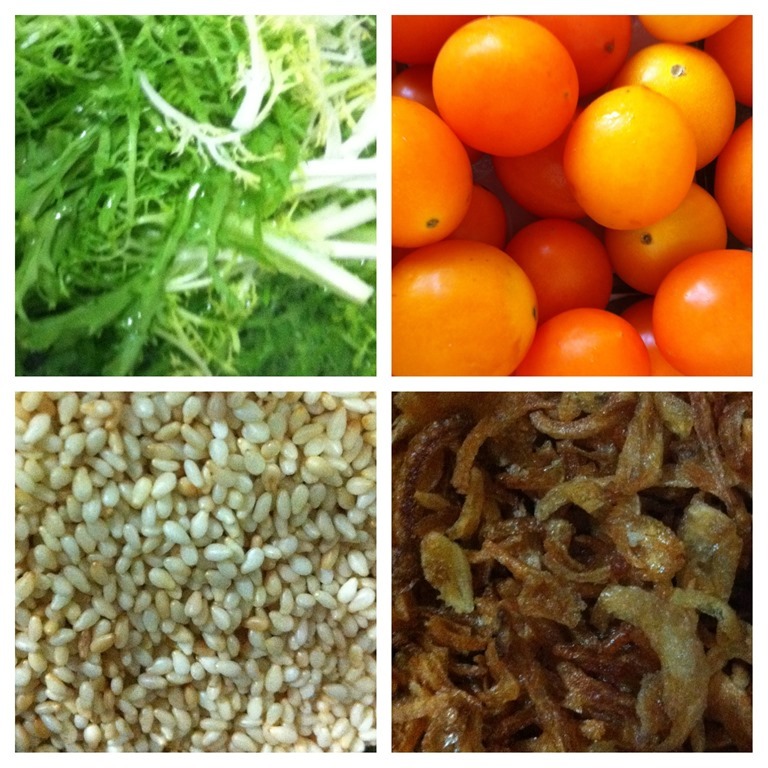 In traditional Chinese cooking, blanching of vegetables is generally not common. The exposure of Western Cuisines have made me come out with this fusion which I believed will be acceptable by both Asians and non-Asians. 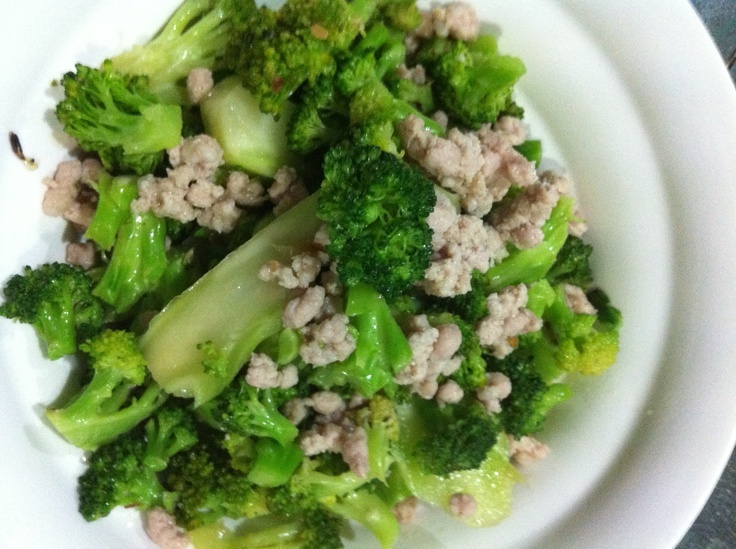 Without stir frying, the vegetables can be equally tasty. While this resembles salad in western cuisines’ term but it have elements of oriental cooking due to the type of condiments used. It will definitely healthier because fats intake will be limited and more vitamins will be retain in the vegetable resulting from shorter cooking time. It will also eliminate the fear of eating raw vegetables which is supposed to be even more nutritious. 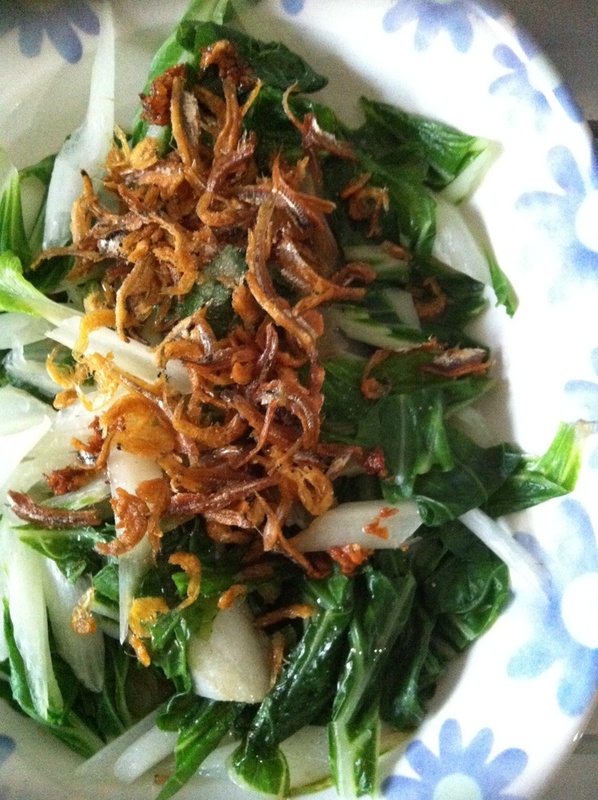 My favorite dressing is a type of dip for my fried fish (light soya sauce + chili + lime juice + shredded garlics + bit of sugar). For me , it blends equally well when I used it for my blanched vegetables. I like to prepare this if I want to lose weight and of course this is an acquired taste. You can invent your own dressing and you will be surprised that how well received blanched vegetables are if the dressings are right! Why don’t you try my favorite dressing and let me know what you think? This entry was posted in Dish and tagged 8, anchovies, Baby, belachan, Black, Both, brocolli, Capsicum, celery, century, chef, Chicken, chickens, CHINESE, Choy, chrysanthemum, combination, combinations, creativities, cuisines, dishes, dressings, fats, Greens, habitat, island, Japanese, juice, kailan, Lime, Macademia, Mayonese, Meat, method, Onion, Oyster, Pepper, Pine, pork, postaday, Prawns, preparation, Salt, Sauce, Seasame, Seasonings, Shrimps, Stem, stripes, Sugar, Tomato, tomatoes, Variations, vegetables, Vinegar, Western, White. Bookmark the permalink. Hi. 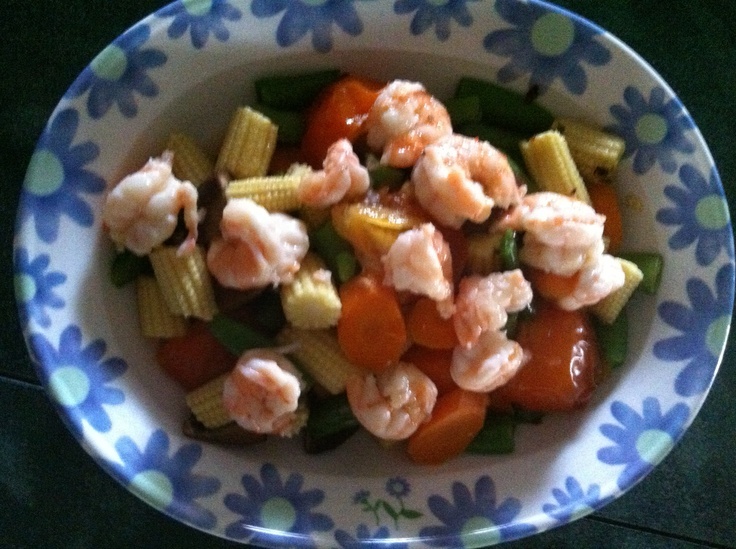 Would like to try mixed vege with prawn. Different type of vege can be blanched simultaneously?3 mins is sufficient for the blanching? Thanks for sharing. Thanks for the advice. I will definitely try this but the thing that worry me is the seasoning part which affects the taste of the dish as well.